Sarah is a 20-year-old mother of a 17-month-old girl born via cesarean section after an unexpected pregnancy with a man who is not involved and who denies that he is the father. Hannah came into foster care at 7 months when Sarah “called Child Protective Services to tell her that I was going to be homeless the next day and said it was time to take her.” At the time of Hannah’s birth, Sarah was in a relationship with Jake, who was identified as the father on the birth certificate. A paternity test concluded that he was not the biological father, and Child Protective Services initially got involved when he became irate in the hospital. He participated in supervised visitation during Hannah’s first month in care but shortly afterward broke up with Sarah and signed off his rights. Meanwhile, Sarah reported not being able to handle her postpartum depression and care for her daughter. She often worked and stayed with friends while Hannah stayed with Sarah’s grandmother, who has significant mental health issues; Jake, who has a traumatic brain injury and significant mental health issues, or Jake’s family. With many different caregivers, Hannah lacked consistency in her first 7 months of life. Still, throughout my relationship with Sarah, I never doubted her love and dedication to her daughter, though her mental health and history of trauma got in her way of being able to provide Hannah the emotional support she needed. I became involved when the foster care worker and Sarah called into Community Mental Health to request Infant Metal Health Services, which the local judge had been requiring for all children 0-3 removed for abuse or neglect. I met them within the week and completed an IMH assessment in a tiny room at the foster care agency. My first impression when I met the family was that they appeared comfortable together, as evidenced by Hannah having fallen asleep on her mom. During that first visit, Sarah shared loving stories of her daughter with an optimistic attitude. I was unsure how to move forward or how I might be helpful to her, but decided I would open their case and provide home-based IMH services based on the fact that Hannah had been removed from her mother. My role as an IMH worker for Community Mental Health is to help provide resources, developmental guidance, interaction guidance, support and parent infant psychotherapy. For the first several months with Sarah I was confused and didn’t feel like we were getting anywhere or that I was able to provide any of those basic Infant Mental Health pieces. Therapeutically it appeared that nothing had changed as a result of our sessions for either myself as a clinician or for Sarah as a mother. I met with Sarah separately at a local fast food restaurant (her choice) and visited her during supervised visitation at the agency. It took months before I felt like we were making progress, and in all that time Sarah was never approved for unsupervised visitation with her daughter, even with me present. When I would meet with Sarah independently, her stories about her past were sparse and confusing. During the visits with her daughter, Sarah would often ask her to crawl toward her for hugs or cuddles – seeking to satisfy her own attachment needs. I knew that I was building a trusting relationship, but wondered if she would open the door to let me in as I hung here in the doorway, trying to figure out how this dyad got to this place. Sarah had started antidepressants and was working a stable job, but I didn’t see much of a shift in her presentation during our therapeutic sessions. Her interactions with her daughter continued to be similar from week to week and her self-esteem and self-image after having maintained a stable job didn’t shift as I would have expected it to. I was stuck and wasn’t sure what kept me hanging in there, but this dyad had a story to tell. Looking back, however, I am certain that it was reflective supervision that allowed me to continue our work together. Five months into our work together I requested that I supervise Sarah and Hannah’s visits so that there would not be any other workers involved. This was a turning point. Without others in the room, Sarah was able to be open and honest and share her struggles. She was like a sponge to new knowledge about her daughter and though she didn’t ask questions, she was always ready to try something new. She picked up on my modeling very quickly, and I felt that things really started moving. While she sat on the couch and asked her daughter to come to her, I sat on the floor and gently engaged Hannah with the educational toys Sarah had provided. I applauded her for having baby supplies and fun toys and I would invite her into the play by talking for Hannah. When she would ask Hannah to come and give her a hug or to come and crawl to her and she chose not to, I would talk for Hannah saying “Oh, Mom, come down here and play with me. I am just not ready for a hug yet but I would love it if you rolled the ball to me.” Sarah caught right on and sat down on the floor and began rolling the ball. Hannah smiled with delight and increased her proximity to her mother. Sarah’s demeanor changed and her confidence grew. During visitations, Sarah was getting her own needs met, likely through our relationship and in her engagement with her daughter, while also meeting her daughter’s needs. We had a few bumps in the road as I felt that she tested my strength to continue by blaming me for continued supervised visitation, but we worked through those moments and I felt as though they strengthened the therapeutic relationship and deepened our work together. When she tried to push me away, I continued to support her through her frustration and fear and tried to prove that our relationship could withstand those big feelings. I would have not been able to stay in this space for Sarah without the support I found in reflective supervision, where I was able to express my concerns, worries and my own big feelings. Hannah was bright and engaging and achieved all of her developmental milestones on time. She learned to crawl, pull to a stand, walk and begin to use words like “mom” during our work together, and Sarah proudly showed off her accomplishments during each visit. In the beginning the visits often had uncomfortable moments when Sarah would seek out Hannah to hug her and Hannah would resist because she was actively engaged in the many awesome toys that Sarah provided. This caused Sarah to feel rejected, but we were able to process through these feelings and she was ultimately able to identify when she needed her needs met and separate that and ensure she was tuned in with her daughter and able to meet her needs in the relationship. This was a turning point for Hannah as evidenced by her increased comfort in seeking out her mother to meet her exploration as well as attachment needs more and more in each visit. It was around this time that Sarah was granted one unsupervised visitation in her home with her daughter. During our conversations, Sarah acknowledged that she had had many intimate partners, and throughout the past 12 months she began to talk about feeling shame about having been with so many different men. She has been able to put words to her sadness and fear of being alone. Sarah does not report any history of abuse or neglect but stories of her past provide evidence of a less than ideal childhood. She grew up in her grandmother’s home after her mom “couldn’t take care of us because she always left with different guys.” She did not have a relationship with her father and although she visits him occasionally, she does not have any memories as a child with him. Sarah does not view her childhood as being traumatic or hard, and describes it as “not as bad as other people.” But her grandmother, because of emotional instability and unmanaged bipolar disorder, was deemed an “unfit placement” for Hannah, providing further evidence that growing up with her grandma may likely have been quite tumultuous for Sarah. After 9 months of our working together, Sarah started talking about how she didn’t think she would be able to become “emotionally stable” enough for her daughter in the amount of time required by the Court and worried that she would not get Hannah back. We sat with these feelings and emotions after she lost the privilege of unsupervised visits because of a questionable relationship. She talked with her family, who encouraged her to keep trying to regain custody, and she quickly went back to talking about how hard she was working to get Hannah back (and she really was working hard!). Soon after Sarah shared with me that she was realizing that she couldn’t do it, meaning she couldn’t prove that she was emotionally stable enough or be emotionally stable enough to provide stability for her daughter and to meet her needs that she now recognized. She wanted to sign off on her parental rights and had already talked with Hannah’s foster parents over the past several days asking if they would consider adopting her daughter. They reported that they would love to adopt and Sarah seemed to feel like she was making the best decision for both her and Hannah’s sake. Following my time at the visit, she told the caseworker her decision and, in a court session five days later, her grandmother joined her in signing off on her rights. Sarah wanted things to move as quickly as possible and didn’t want others trying to convince her otherwise. For me, this was a really tricky time. I wanted to be supportive but was not informed she had signed off on her rights until I showed up for our scheduled visit time and she was not there. I later talked with the caseworker and Sarah and continued to try and be supportive despite not having known such big changes had actually occurred. I wondered if she worried about my thoughts and feelings around her terminating her own rights since my daughter was just a few months younger, but I hung in there, continuing to show her our relationship could withstand this too. This was hard, but ultimately I knew it was the hard stuff that needed to happen and it felt right. Since Sarah signed off on her rights, I have continued to see her on a weekly basis. I worry about her emotional stability and have seen some worrisome behaviors like drinking, having multiple partners during a few short days and offering to pay other’s bills while not having enough money for her own needs. 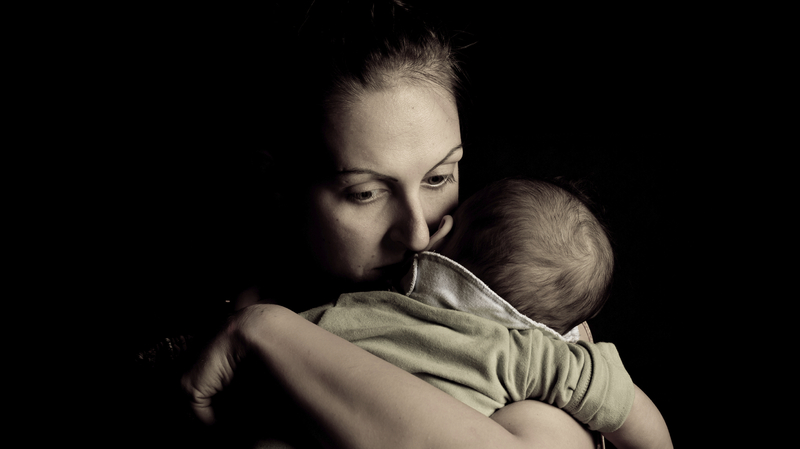 However, I also have seen a lost mother dealing with postpartum depression struggling to meet more than just her child’s physical needs transform into a responsible, much more stable, loving, caring mother who made a challenging decision about what she thought was best for her and her child. While she continues to have some worrisome behaviors, overall Sarah has been able to make significant changes through our work together. She shared recently that she felt like she had failed by signing off on her rights. Through our relationship she was able to accept that she had made the decision that was best for her daughter and that deep down inside, she knew from the very beginning that raising her daughter on her own was too much for her to handle. Throughout this process I had a few visits with Hannah in her foster family’s home. The foster parents, who are working on adoption, are warm and loving and have a lot of support in raising her. Although they are new at parenting, they are open to feedback and suggestion and have proven to be a strong support for Sarah. Initially the foster parents and agency had all committed to allowing Sarah to see Hannah but shortly after termination they changed their minds, reportedly saying that it was not in her best interest to see her mother. I talked with the foster mother and expressed concern about what a loss this must be for Hannah and how confusing it must be at 19 months. In addition, the foster mother reported that they would no longer refer to Sarah as “Mom” and would explain the situation when she is much older. Again I provided her thoughts that this would be extremely confusing and that helping Hannah understand that she has a birth mom and an adoptive mom as two separate but loving people in her life would be in her best interest. I felt uncharacteristically bold and suggestive of what was in Hannah’s best interest but felt passionate about the importance of continuing to include Sarah in her life as a positive support and caring parent. Although the foster parents still seemed firm in their decision to stop contact, a few weeks later I heard from Sarah that she had been able to see her daughter after the foster parents had invited her to a doctor’s appointment. Victory! While I wish I would be able to continue to work with this mom and support her relationship with her daughter, unfortunately our work has come to an end. Our authorizations have expired and while we have achieved the goal of permanency for her daughter, I have left the door open for future therapeutic work together. It was through the process of individual and group reflective supervision that I was able to make sense of Sarah’s presentation and behaviors, the foster family’s experience and the foster agency’s role as well as my own feelings and reactions in the various relationships with this family. Halfway through our work together it became clear that helping Sarah explore her feelings about voluntarily relinquishing Hannah was the needed focus. I never offered that as a suggestion to Sarah but supported her emotions as she explored feelings that she had not had a chance to deal with previously. Through her honesty and trust in our therapeutic relationship, Sarah grew tremendously, and I felt as though I was able to grow as a clinician as well. While working with a family that has lost temporary custody presents many challenges for the worker, the challenges that the family faces are excruciatingly hard. As a caseworker and IMH therapist it adds an enormous load to the work that often has to be done in a very short time. I am grateful that we have achieved stability for Hannah and have hope that through Sarah’s experience in our relationship, she is able to continue to focus on healing and taking care for herself. Emily Kohler, LMSW, IMH-E (II) is an Infant Mental Health Therapist at Pine Rest Christian Mental Health Clinic.